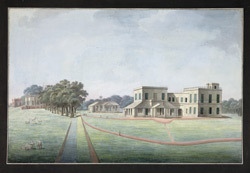 Watercolour of the houses at Maidapur in West Bengal, by an anonymous artist working in the Murshidabad style, part of the Hyde Collection, c. 1790-1800. Inscribed on back in ink over pencil: 'Mr. Burgess's House at Moidapore near Moorshedd. rented formerly by Captn. Parlby'; in pencil: 'East part of Moidapore House and Mrs. Motford in the near ground.'. The East India Company was founded in 1600 and in the 17th and 18th centuries it became one of the most powerful trading companies in the world. Its influence on Indian culture was far-reaching. Company painting first emerged in Murshidabad in the second half of the 18th century. It is a style of miniature painting that developed in response to the tastes and influences of the British serving with the East India Company. The style subsequently spread to other British centres, the most notable being Patna, Benares (Varanasi), Delhi and Lucknow. This drawing shows the house of Mr. Burgess, the two storeyed stuccoed house in the foreground to the right.